In the Ozark Border south of St. Louis, a series of natural openings punctuate the dry, rocky forests of Jefferson County. Commonly called “glades” or “cedar glades,” these islands of prairie in a sea of forest are home to plants and animals more commonly associated with the Great Plains region further to the west. Extending in a narrow arc from central Jefferson County east and south into northern Ste. Genevieve County, these glades occur most commonly on south and southwest-facing slopes below forested ridges and are characterized by thin soils and exposed dolomite bedrock of Ordovician age. 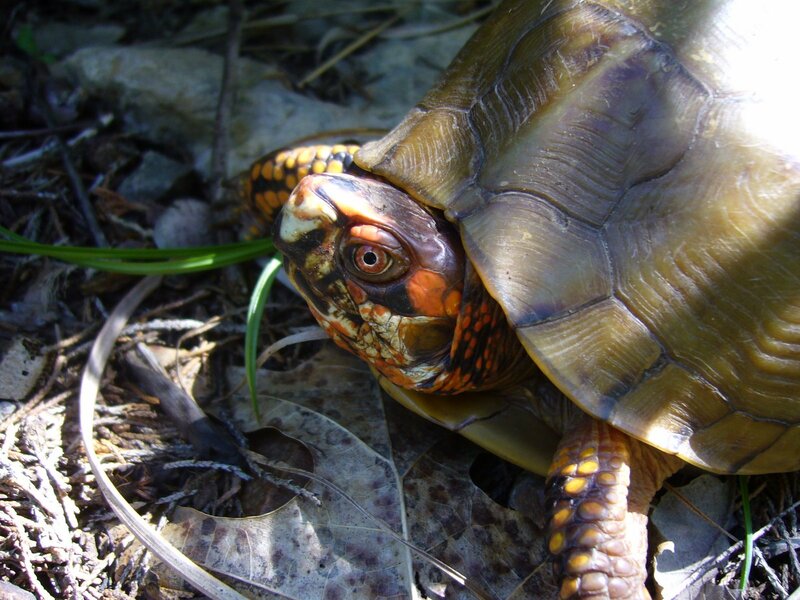 Glades are, in fact, a common natural feature throughout much of the Ozark Highlands, an extraordinary plateau where the great eastern deciduous forest begins to yield to the western grasslands. 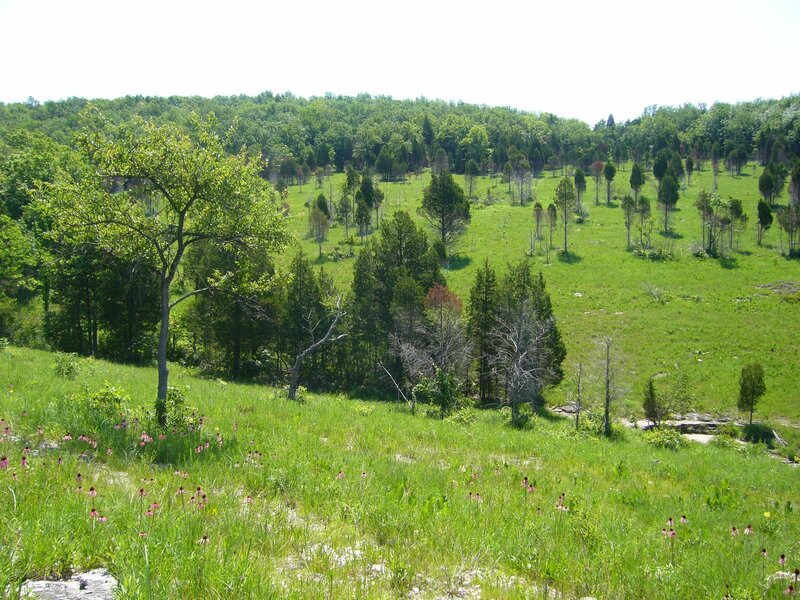 A much more extensive system of dolomite glades occurs in the White River Hills of southwest Missouri, where they often extend up steep slopes and over the tops of knobs to form what Schoolcraft called “naked peaks” and are now called “balds” (and spawning the “Baldknobbers” of Branson fame). Additional glade complexes occur throughout the Ozark Highlands on different rock substrates – igneous glades abound in the St. Francois Mountains, sandstone glades dot the Lamotte landscape in Ste. 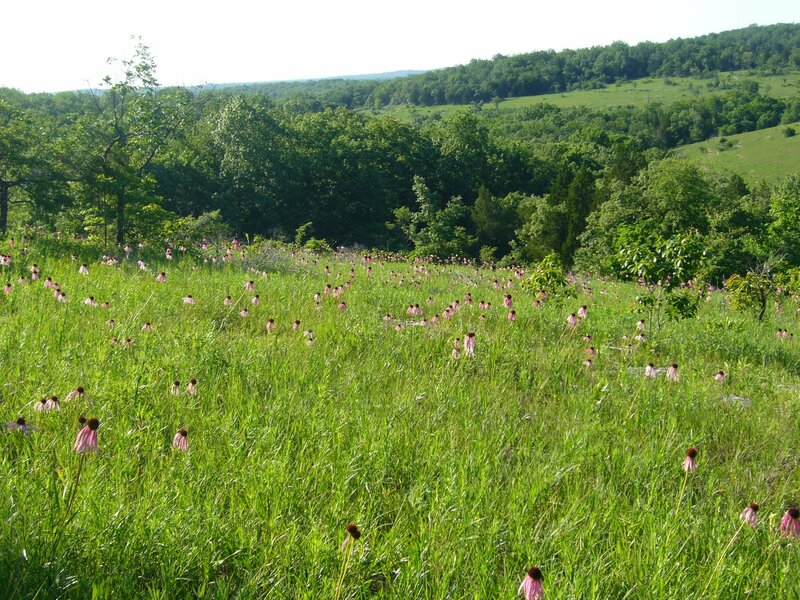 Genevieve County and the northern and western Ozarks, limestone glades can be found in the northern Ozarks near Danville and Lake of the Ozarks, and chert glades occur in extreme southwest Missouri. 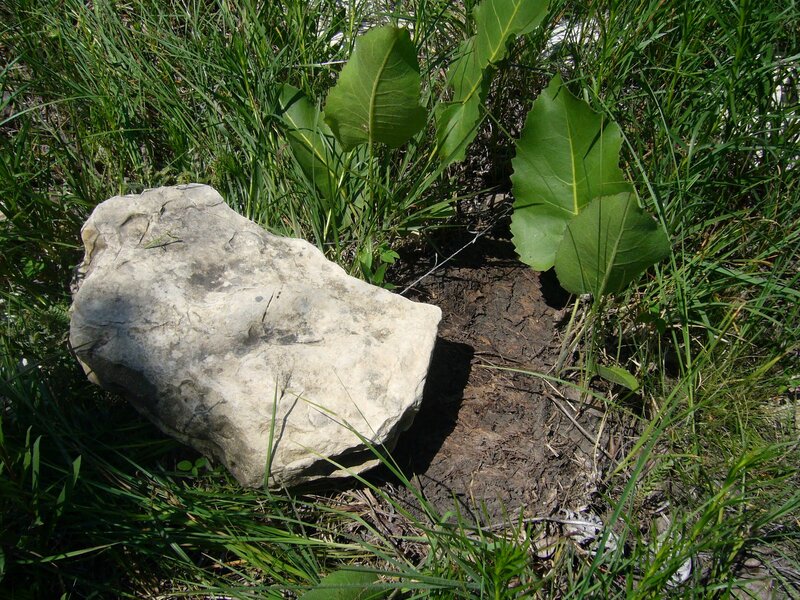 These different glade systems share a common feature – shallow soils where tree establishment is limited due to summer moisture stress. They differ vegetationally, however, due to differences in hydrology and soil chemistry as a result of their different substrates. Floristically, dolomite glades exhibit a high degree of diversity relative to other glade types. The term “glade” is derived from the Old English “glad,” meaning a shining place – perhaps the early settlers found their open landscapes a welcome respite after emerging from the confining vastness of the eastern deciduous forest. Whatever the meaning, the glades of Jefferson County hold a special place in my heart, for I “grew up,” entomologically speaking, in those glades. As a young entomologist, fresh out of school, I spent many a day scrambling through the glades and surrounding woodlands. It was here where my interest in beetles, especially woodboring beetles, was born and later grew into a passion. For eight years I visited these glades often – attracted by the extraordinary diversity of insects living within the glades and congregating around its edges. My earliest buprestid and cerambycid papers contain numerous records from “Victoria Glades” and “Valley View Glades” – the two best-preserved examples of the glades that once occurred extensively throughout the area (more on this later). My visits to these glades ended in 1990 when I moved to California, and although I moved back to the St. Louis area in 1995, the focus of my beetle research has more often taken me to places outside of Missouri. It had, in fact, been some 10 years since my last visit to these glades until last week, when I was able to once again spend some time in them. 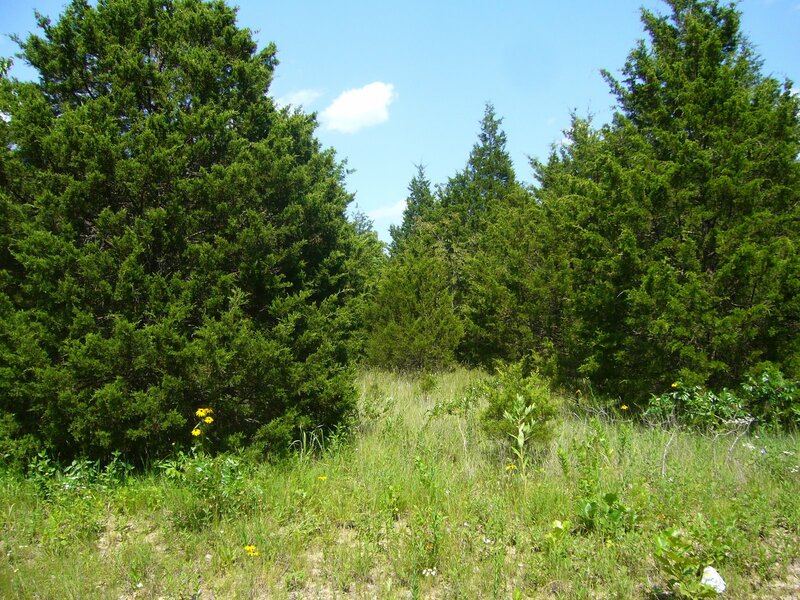 Ozark glades differ from the true cedar glades of the southeastern U.S. in that they are not a climax habitat – they depend upon periodic fires to prevent succession to forest. 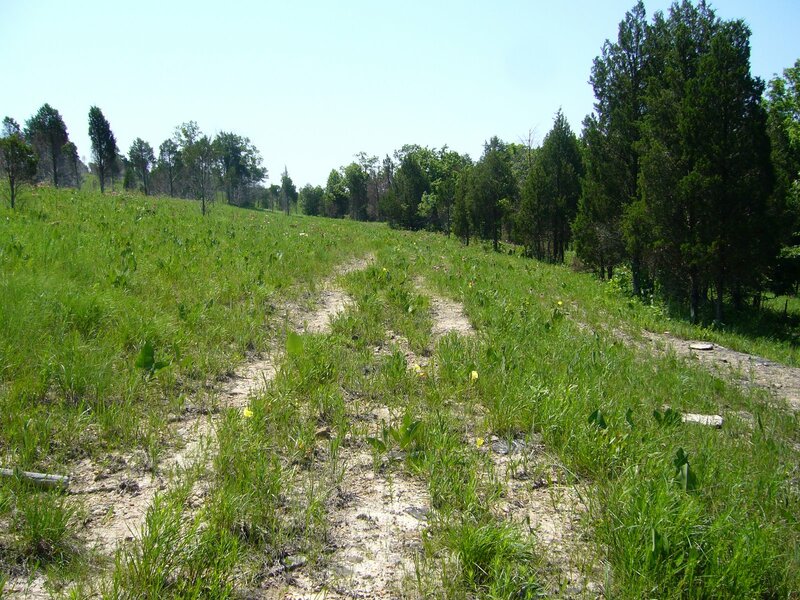 Some recent authors have suggested the term “xeric dolomite/limestone prairie” be used to distinguish the fire-dependent glades of the Ozarks from the edaphic climax cedar glades of the southeast (Baskin & Baskin 2000, Baskin et al. 2007). Fires have been largely suppressed throughout Missouri since European settlement, leading to encroachment upon the glades by eastern red-cedar (Juniperus virginiana). Pure stands of red-cedar have developed on many former glades, crowding out the herbaceous plants that depend upon full sun and leading to soil formation that supports further encroachment by additional woody plant species such as post oak (Quercus stellata), blackjack oak (Q. marilandica), flowering dogwood (Cornus florida), and fragrant sumac (Rhus aromatica) from the surrounding woodlands. Fire has returned to many of the Ozark glades situated on lands owned or managed by state and federal agencies such as the Missouri Department of Conservation, Missouri Department of Natural Resources, and U.S. Forest Service, as well as private conservation-minded organizations such as The Nature Conservancy. These agencies have begun adopting cedar removal and fire management techniques to bring back the pre-settlement look and diversity of the Ozark Glades. This is particularly true at Victoria Glades and Valley View Glades, the two largest and most pristine examples of the Jefferson County dolomite glade complex. Fires have been used to kill small red-cedars in the glades, as well as rejuvenate their herbaceous plant communities. Larger red-cedar trees are not killed outright by fire and must be removed by chainsaws. This above distant view of the TNC parcel at Victoria Glades shows many such burned red-cedars. 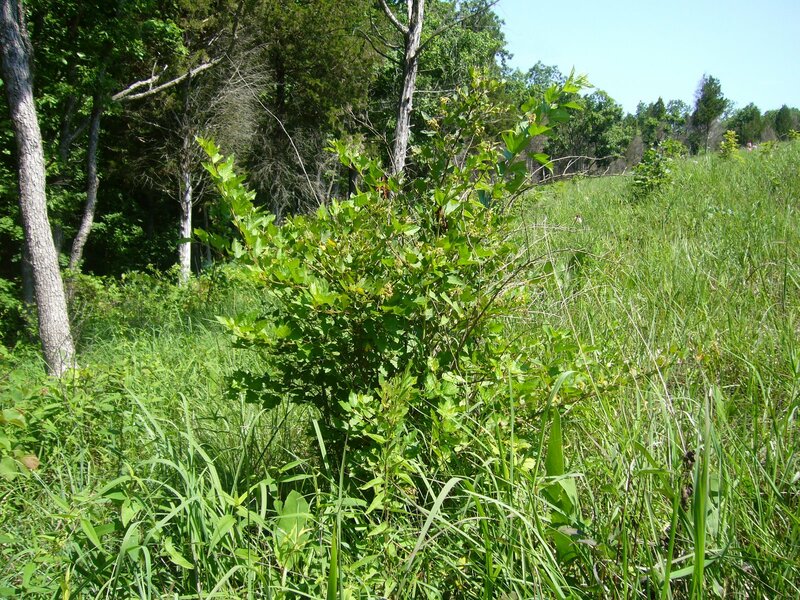 The glades themselves are not the only habitat to benefit from this aggressive management – when I was doing my fieldwork here in the 1980’s the surrounding woodlands were a closed post oak forest bordered by fragrant sumac and with little or no understory in the interior. The photo at right now shows an open savanna with a rich understory of not only sumac and other shrubs, but also many herbaceous plants as well such as black-eyed susan (Rudbeckia hirta) and American feverfew (Parthenium integrifolium). Such open woodland more closely resembles what Schoolcraft saw across much of the Ozarks during his journey almost two centuries ago. Victoria and Valley View Glades are dominated by little bluestem (Schizachyrium scoparium), Indian grass (Sorghastrum nutans), big bluestem (Andropogon gerardii) and prairie dropseed (Sporobolus heterolepis). A smaller but highly charismatic non-grass flora is also found on the glades – species such as Missouri evening primrose (Oenethera macrocarpa) (left), pale purple coneflower (Echinacea simulata) (pictured above and below), and prairie dock (Silphium terebinthinaceum) not only add beautiful color but also support both vertebrate and invertebrate wildlife. 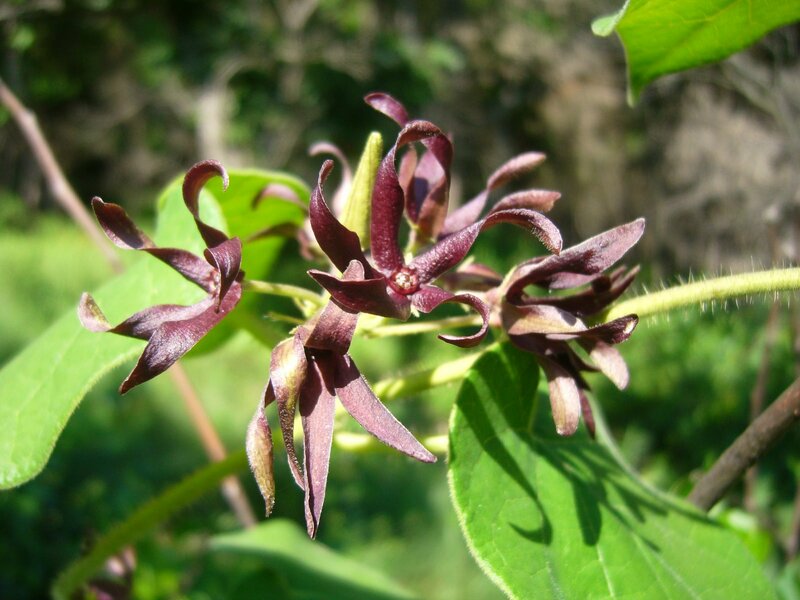 The Fremont’s leather flower (Clematis fremontii) is a true endemic, occurring only in this part of Missouri and entirely dependent upon these glades for its survival. 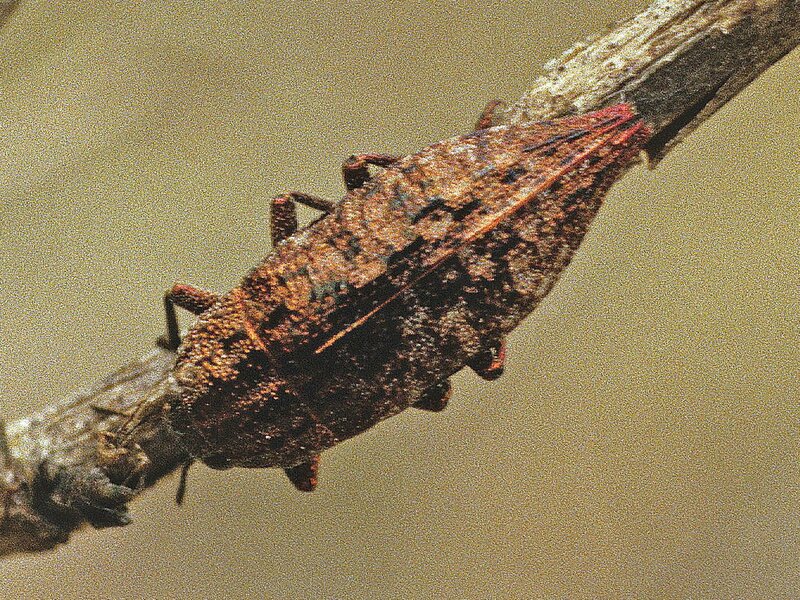 Less well studied is the vast insect fauna associated with the glades. It is here where I first discovered the occurrence of Acmaeodera neglecta in Missouri. This small jewel beetle is similar to the broadly occurring A. tubulus but at the time was known only from Texas and surrounding states. In collecting what I thought were adults of A. tubulus on various flowers in the glades, I noticed that some of them were less shining, more strongly punctate, and exhibited elytral patterning that was often coalesced into longitudinal “C-shaped” markings rather than the scattered small spots typical of A. tubulus. These proved to be A. neglecta, which I have since found on many glade habitats throughout the Ozark Highlands. 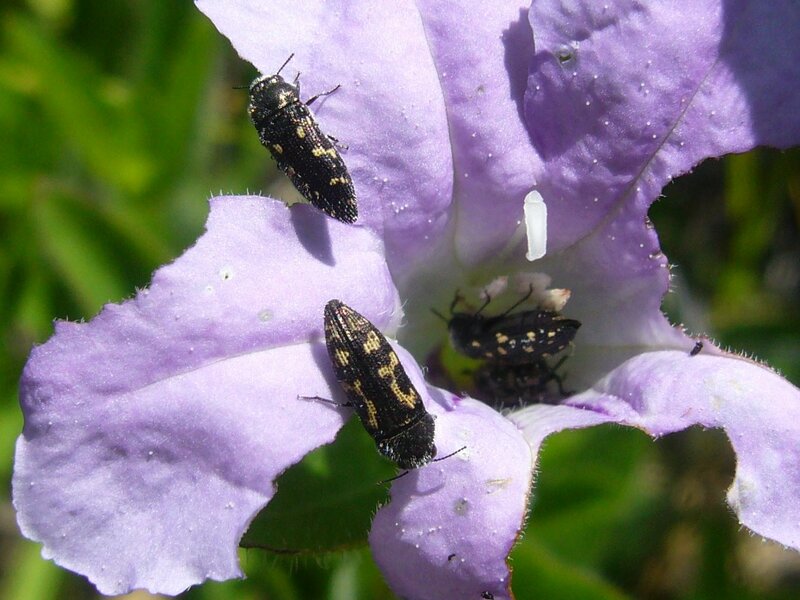 Both species can be seen in this photo feeding on a flower of hairy wild petunia (Ruellia humilis) – the lower individual is A. neglecta, while the upper individual and two inside the flower are A. tubulus. Another interesting insect-plant association I discovered at these glades was the strikingly beautiful Dicerca pugionata – another species of jewel beetle – and its host plant ninebark (Physocarpus opulifolius). Only a single Missouri occurrence had been reported for D. pugionata, despite the common occurrence of its host plant along rocky streams and rivers throughout the Ozark Highlands. 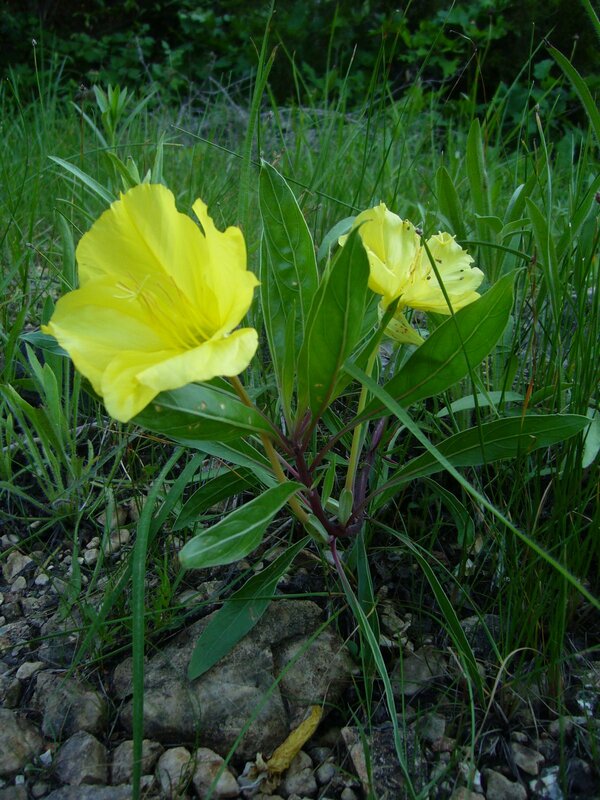 This plant also grows at Victoria and Valley View Glades along the intermittent streams that drain the glades and in the moist toeslopes along the lower edges of the glades where water that has percolated through the rocks and down the slopes is forced to the surface by an impermeable layer of bedrock. Unlike the tall, robust, lush plants that can be found in more optimal streamside habitats with good moisture availability, the ninebark plants of Victoria and Valley View Glades are small and scraggly, usually with some dieback that results from suboptimal growing conditions. 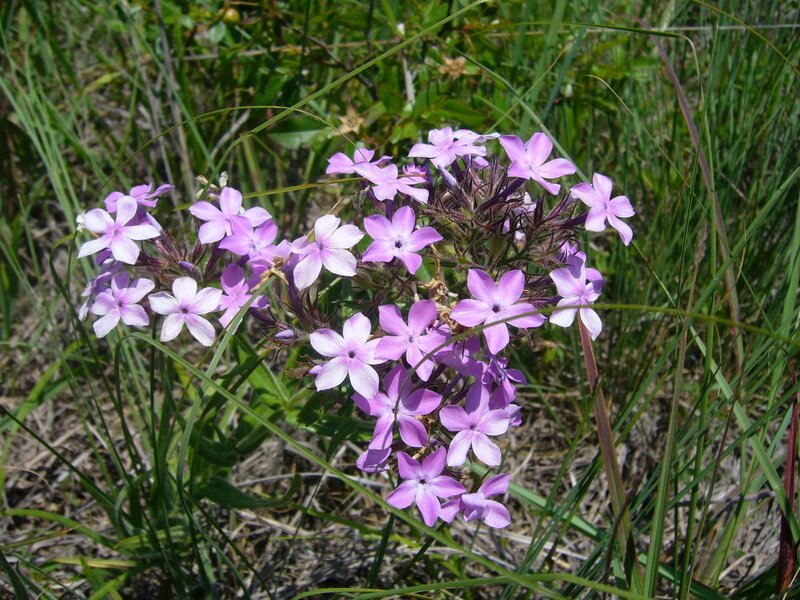 I surmise these plants have reduced capabilities for fending off attacks by insects, including D. pugionata, and as a result a healthy population of the insect thrives at these glades. Some might be inclined to call this beetle a pest, threatening the health of one of the glade’s plants. In reality, the insect finds refuge in these glades – unable to effectively colonize the vast reserves of healthy plants that grow along streams throughout the rest of the Ozarks, it strikes a tenuous balance with plants that are themselves on the edge of survival. Despite the success in moving Victoria and Valley View Glades closer to their pre-settlement character, the integrity of these areas continues to be challenged. Poachers take anything of real or perceived value, and ATV enthusiasts view the open spaces as nothing more than tarmac. 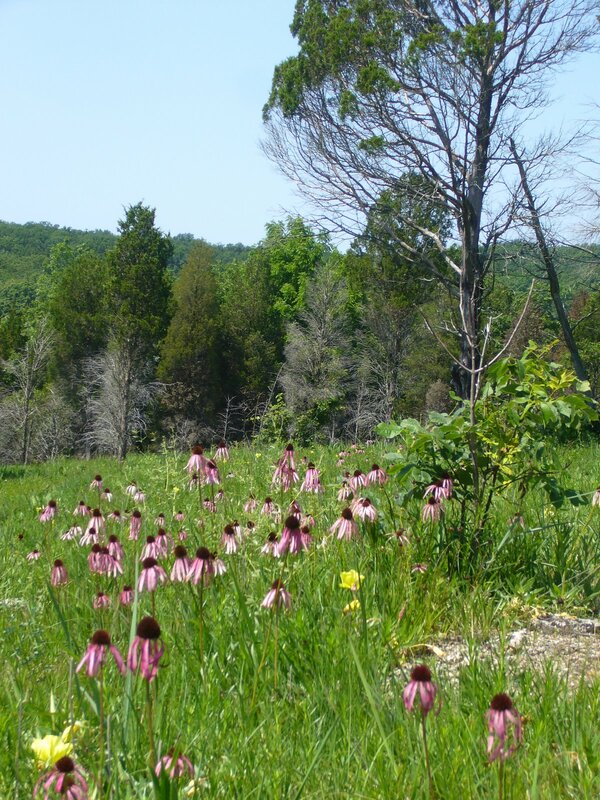 Pale purple coneflower occurs abundantly on these Jefferson County glades (but sparingly in other habitats – primarily rocky roadsides), where they provide a stunning floral display during June and sustain innumerable insect pollinators. Plants in the genus Echinacea also have perceived medicinal value, as herbalists believe their roots contain an effective blood purifier and antibiotic. There are no conclusive human clinical trials to date that fully substantiate this purported immune stimulating effect (McKeown 1999). 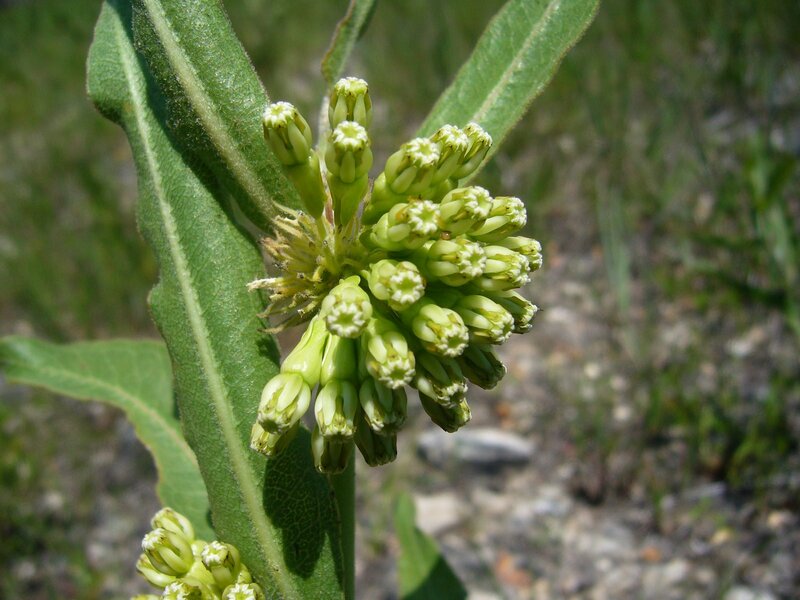 Nevertheless, demand for herbal use has skyrocketed in recent decades, prompting widespread illegal harvesting of several coneflower species throughout their collective range across the Great Plains and Ozark Highlands. I witnessed massive removals of this plant from both Victoria and Valley View Glades during the 1980’s, but the pictures I took this year suggest that such illegal harvests have been suppressed and that the populations at both sites are recovering nicely. The same cannot be said for the practice of rock flipping. This was a problem I witnessed back in the 1980’s, and I saw fresh evidence of its continued occurrence at both sites. The thin soils and sloping terrain leave successive layers of dolomite bedrock exposed, the edges of which shatter from repeated freeze-thaw cycles to create rows of loose, flat rocks along the bedrock strata. Lizards, snakes, tarantulas, and scorpions find refuge under these loose rocks, only to be ripped from their homes by flippers and transferred to a dark, cold terrarium to endure a slow, lingering death. As if poaching the glade’s fauna and watching them slowly die isn’t bad enough, the flippers add insult to injury by not even bothering to replace the rock in its original position after stealing its inhabitant, amounting to habitat destruction three times greater than the area of the rock itself. Firstly, the habitat under the rock is destroyed by sudden exposure of the diverse and formerly sheltered microfauna to deadly sunlight. Next, the habitat onto which the rock is flipped is also destroyed, as the plants growing there begin a slow, smothering death. Lastly, the upper surface of the rock, sometimes colonized by mosses and lichens that might have required decades or longer to grow, usually ends up against the ground – its white, sterile underside becoming the new upper surface. 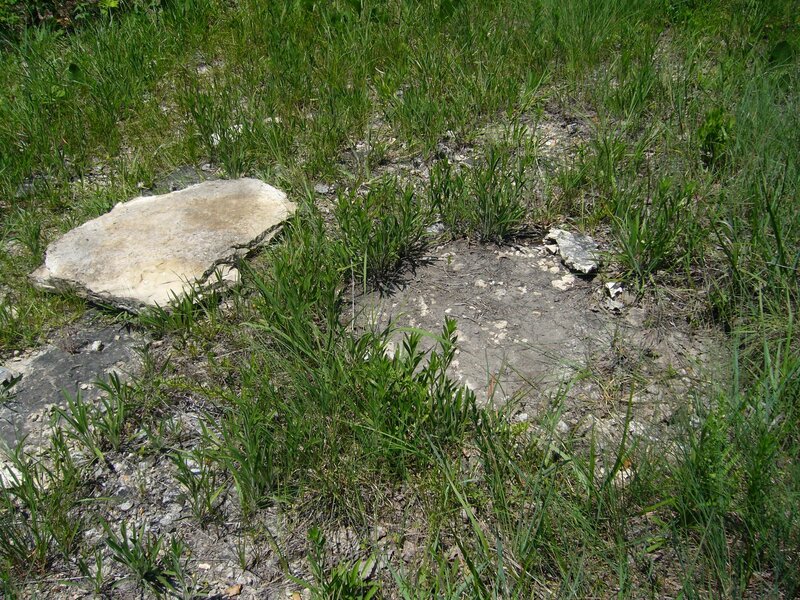 Rock flipper scars take years to heal, and nearly all of the flat, loose rocks seen in the more accessible areas of the glades exhibit scars of varying ages next to them. 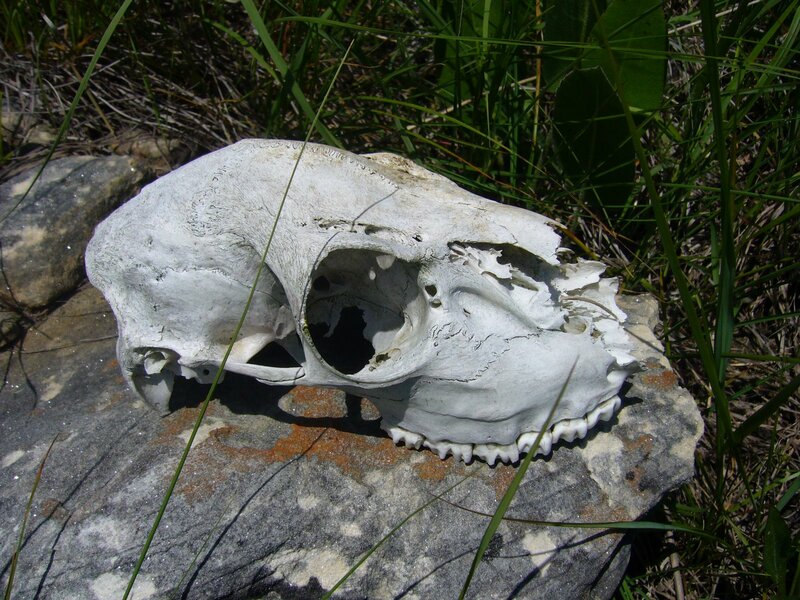 If a scar is fresh (first photo), I generally return to the rock to its original position – the former inhabitants cannot be brought back, but at least the original habitats are saved and can recover quickly. However, if a scar is too old (2nd photo) it is best to leave the rock in its new position – replacing it only prolongs the time required for recovery. Even more damaging is ATV use. Herbaceous plants and thin soils are no match for the aggressive tread of ATV tires, and it doesn’t take too many passes over an area before the delicate plants are killed and loose soils ripped apart. I witnessed this become a big problem particularly on Victoria Glades during the 1980’s – actually finding myself once in a face-to-face confrontation with an ATV’er. Fortunately, he turned tail and ran, and it appears (for now) that such abuses have stopped, as I saw no evidence of more recent tracks during this visit. But the scars of those tracks laid down more than two decades ago still remain painfully visible. I expect several more decades will pass before they are healed completely. My return to Victoria and Valley View Glades was a homecoming of sorts, and I was genuinely pleased to see the progress that has been made in managing these areas while revisiting the sites where my love affair with beetles was first kindled. Sadly, however, the larger glade complex of Jefferson County continues to deteriorate. Restoration acreage aside, red-cedar encroachment continues unabated on many of the remaining glade parcels – large and small – that dot the south and southwest facing slopes in this area. It has been conservatively estimated that as much as 70% of the original high quality glades in Missouri are now covered in red-cedar. Many of these are privately held – their owners either do not recognize their ecological significance or are loathe to set fire to them. An example can be seen in the picture here – this small parcel is part of the Victoria Glades complex but lies on private land in red-cedar choked contrast to the Nature Conservancy parcel immediately to the south. Small numbers of herbaceous plants persist here, but without intervention by fire or chainsaw their numbers will continue to dwindle and the glade will die. Aside from the loss of these glades, the continuing reduction of glade habitat complicates management options for preserved glades as well. Many glade associated invertebrates are “fire-sensitive” – i.e., they overwinter in the duff and leaf litter above the soil and are thus vulnerable to spring or fall fires. While these fires are profoundly useful for invigorating the herbaceous flora, they can lead to local extirpation of fire-sensitive invertebrate species within the burn area. Recolonization normally occurs quickly from unburned glades in proximity to the burned areas but can be hampered if source habitat exists as small, highly-fragmented remnants separated by extensive tracts of hostile environment. Grazing also continues to threaten existing remnants in the Jefferson County complex. Grazing rates are higher now than ever before, with greater negative impact due to the use of fencing that prevents grazers from moving to “greener pastures”. Over-grazing eliminates native vegetation through constant depletion of nutrient reserves and disturbance of the delicate soil structure, leading to invasion and establishment of undesirable plant species. 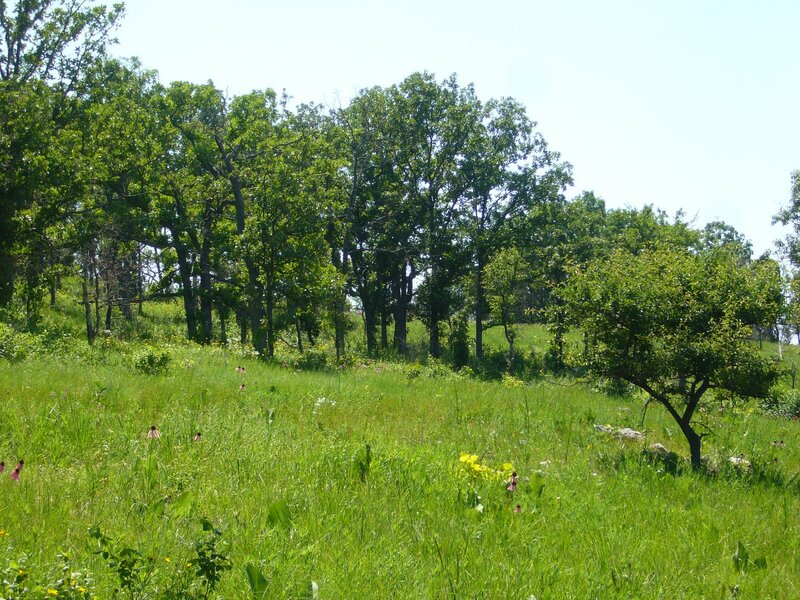 Eventually, the glade becomes unproductive for pasture and is abandoned – coupled with fire suppression this leads to rapid woody encroachment. It is truly depressing to drive through Jefferson County and recognize these cedar-choked glades for what they were, able to do nothing but watch in dismay as yet another aspect of Missouri’s natural heritage gradually disappears. The continued loss of these remnant glades makes careful use of fire management on Victoria and Valley View Glades all the more critical – ensuring that a patchwork of unburned, lightly burned, and more heavily burned areas exists at a given time will be critical for preventing invertebrate extirpations within these managed areas. 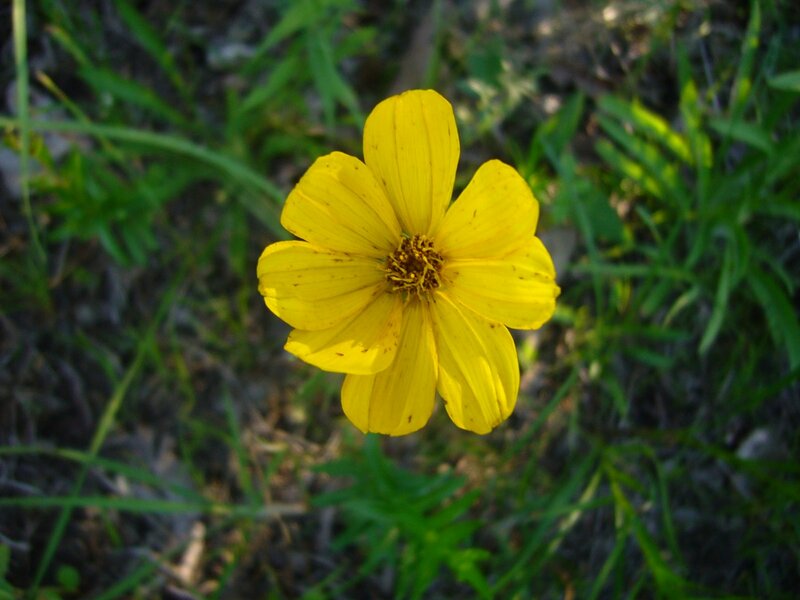 I close by sharing with you a few more of the many photographs I took during this visit – stiff tickseed (Coreopsis palmata), three-toed box turtle (Terrapene carolina triunguis), climbing milkweed (Matelea decipiens – see the excellent post about this plant on Ozark Highlands of Missouri), downy phlox (Phlox pilosa), green milkweed (Asclepias viridiflora), and a “deerly” departed native browser. This entry was posted in Anacardiaceae, Asclepiadaceae, Asteraceae, Buprestidae, Coleoptera, Cornaceae, Cupressaceae, Fagaceae, Mammalia, Onagraceae, Poaceae, Polemoniaceae, Ranunculaceae, Reptilia, Rosaceae and tagged beetles, bones, Botany, conservation, deer, entomology, glades, grazing, habitat management, insects, jewel beetles, landscapes, mammals, Missouri, nature, reptiles, science, shrubs, The Nature Conservancy, trees, turtles, wildflowers, woodlands. Bookmark the permalink. Damned good writing! Wish I had a way with words like you. And you’re obviously addicted to what you do. Keep walkin’. Ted- Fantastic. This is a post I can and will read on work time! Great writing and beautiful photos. The glades remind me a lot of gravel hill prairies here in northeastern Illinois. 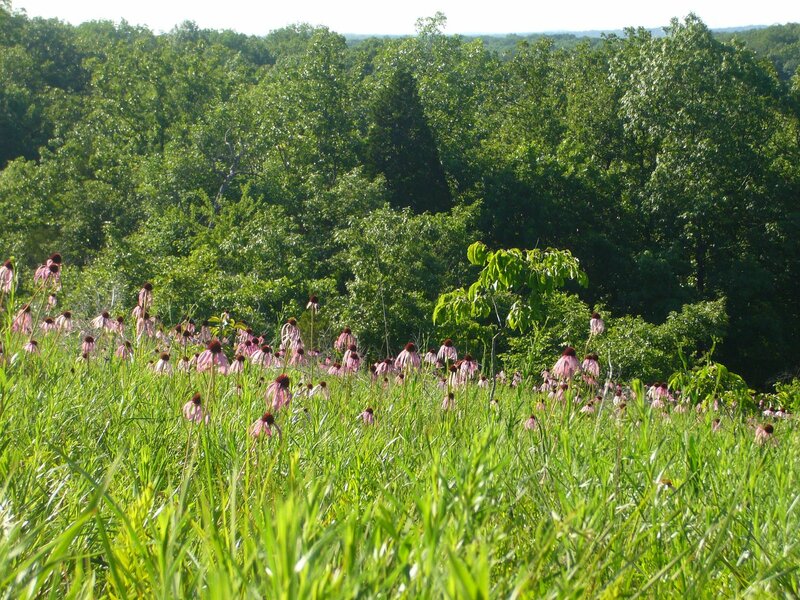 The nutrient-poor soils, dominance of purple coneflower at this time of the year, and many of the problems that you describe are common to both ecosystems. I was out on one where I am steward this afternoon, photographing Typocerus either octonotata or velutina eariler this afternoon. Brilliant, as usual. Thanks for letting your readers know what a spectacular landscape rests just outside of St. Louis. The rock flip pictures were justifiably awful. I bet there are no coachwhips left on Victoria Glade. Thanks for the beautiful photos, the interesting information, your talent, and your utter dedication to the landscapes we both cherish so dearly. Ted, your posts are always so fact-filled and informative that I never know what to single out for a comment. All I can say is: Please keep up the great work. Thanks everyone for your kind comments. I know sometimes my posts can be rather longwinded – I just have trouble trying to decide what to cut out. Don’t cut anything out. Keep walking, talking and writing. I will have to read this about 3 times to absorb all. Great post and beautiful photos well explained. I was out there this year. I found a lot of smashed tarantulas and lizards. Very sad. Sad – I can understand swiping them, but who would smash them?! Thanks for pointing these out to me – it seems that this post has really raised the hackles of some of the folks over there. I really don’t understand the denialism regarding my attribution of the rock-flipping I’ve observed to illegal wildlife collectors. I’ve personally observed these glades over a period of three decades now and have seen firsthand the impact of human activities (both legal and illegal). At any rate, I’ve chimed in on the discussion over there and hopefully helped to clarify the situation at these glades in particular.